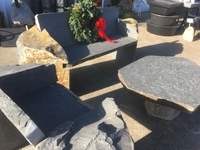 The willingness of our stone artisans to work with new ideas has resulted in a unique line of Pacific Stonescape Original Design garden accents that you will not find anywhere else. 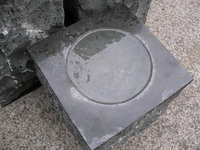 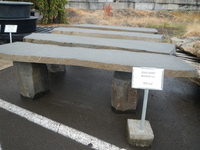 The stone used is Black Basalt and the surfaces are a rustic, split-face texture. 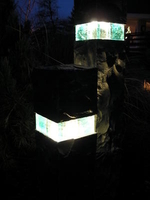 5" x 5" x 27" and 39" tall; split-stone texture; drilled for low voltage light fixture (supplied) with 3" thick lens made from recycled glass for a "water glow" effect. 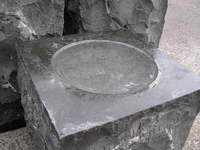 Split-stone texture with polished top surrounding a 10" wide x 2" deep basin. 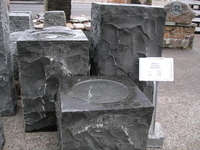 These bird baths can be drilled to create a dramatic, bubbling water feature either as a single element or in a grouping. 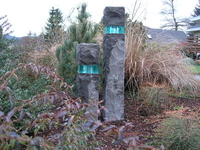 14" x 14" x 21"